Best Video Players for Android: There was a time, maybe around a decade ago when Android smartphones with large display screens were not available and we had to convert high-resolution video files to low-quality file formats like .3gp to watch them on our Java mobile phones. But now things have changed drastically after the launch of smartphones with large display panels. Thanks to these devices, people can now watch movies and other shows directly on their smartphones. This has been made possible by video playing apps that are capable of playing any kind of video files of any size and type. People no longer have to worry about the resolution or the video encoding format of the video files. While most Android smartphones come with a default video player of its own, it may not be sufficient to provide an enriching experience. This is why a host of third-party video players are available for download on the Google Play store that can provide a much more fulfilling movie watching experience on your smartphone. This led us to compile a list of the best video players for Android so that you can find the top ones quickly. While there are plenty of options to choose from when it comes to Android video players, most of them do not offer much variety and features. To sort things out for you, we have personally tested some video players and have presented only the best ones here. 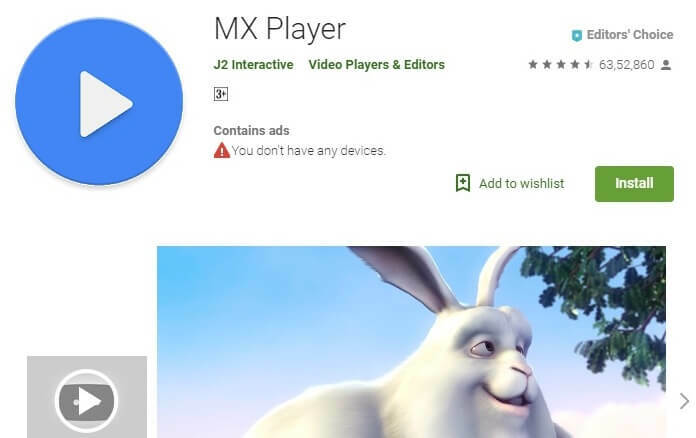 We start off by mentioning MX Player which according to us is the best video player for Android currently. This is because of a host of exciting features and the ease of use of this app. With a very clean user interface, it supports all the major file formats and is also one of the very few players to support multi-core encoding. This means you can run almost any video file with ease. Another aspect that we particularly liked is the audio rendering quality of the app. Apart from that, it comes with many features like subtitle support, gesture controls, zoom in/out and screen lock for kids. The app is available for download on the Google Play store. Originally developed by Kang Young Huee, an independent developer of South Korea, the player was later acquired by Pandora TV in 2008. 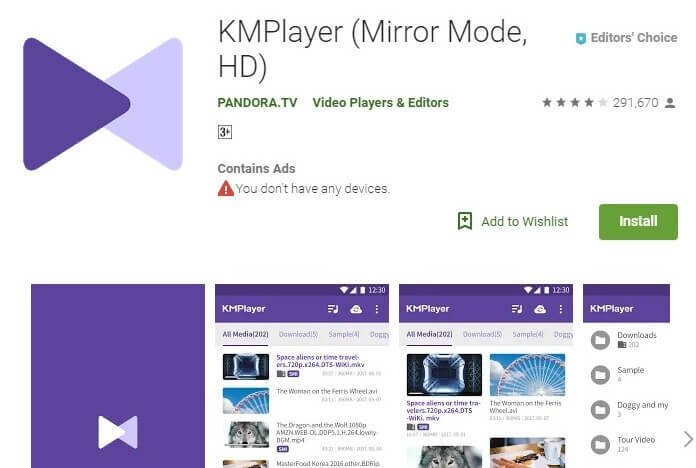 KM Player is a very popular video player on Android because it supports a wide variety of video codecs and formats. 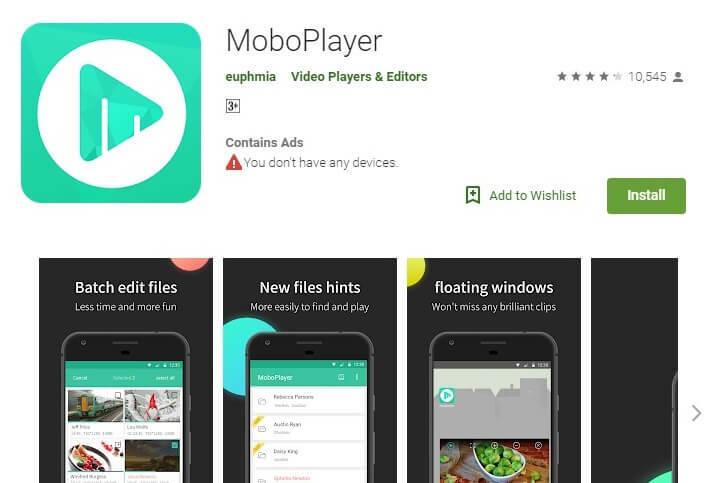 The player can auto-detect video files on your device and also displays the complete name of the stored file. It also boasts some great features like subtitle support in multiple languages, one-touch volume control, video speed control and also the ability to play a certain part in the video repeatedly. 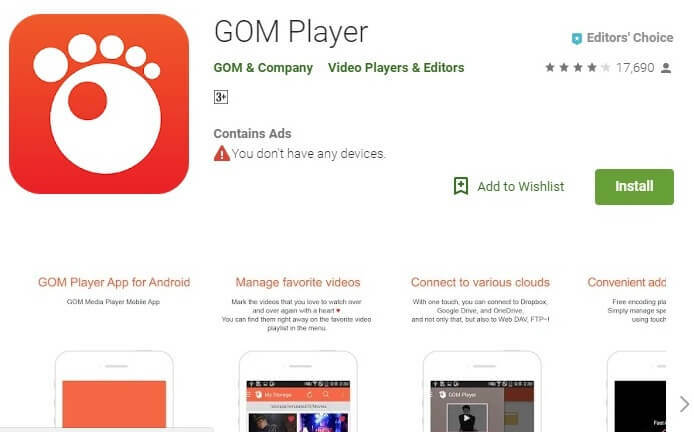 Next up, we have GOM Player which is another free video player for Android. With support for a wide variety of codecs, GOM Player allows you to play any video file saved on your smartphone, Google Drive, Dropbox or any cloud storage platform. The app also allows you to sync to an FTP server so that you can play video files directly from there. Just like the other two video players, GOM player also boasts of many features like subtitle support, brightness control and one-touch volume adjust. Just like its Windows counterpart, VLC player for Android is a very popular video player on Android devices. With a slew of features like subtitle support, multiple codecs support, multi-language audio support, the player has gained massive popularity among the users. It also comes with some unique features like the ability to stream videos directly from an URL apart from playing .ISO image files. 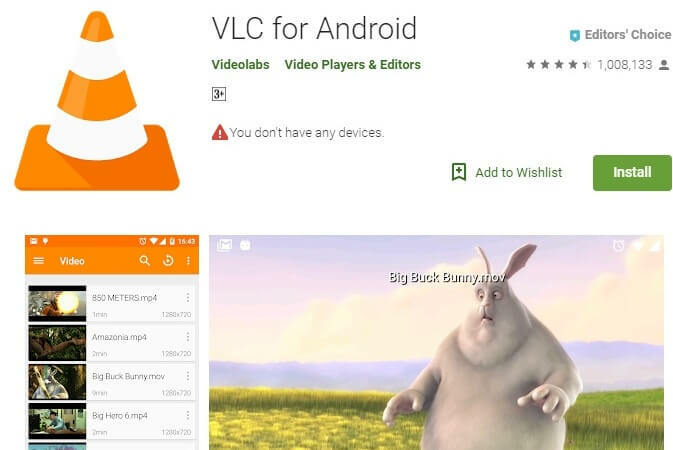 VLC is available for free on the Google Play store. 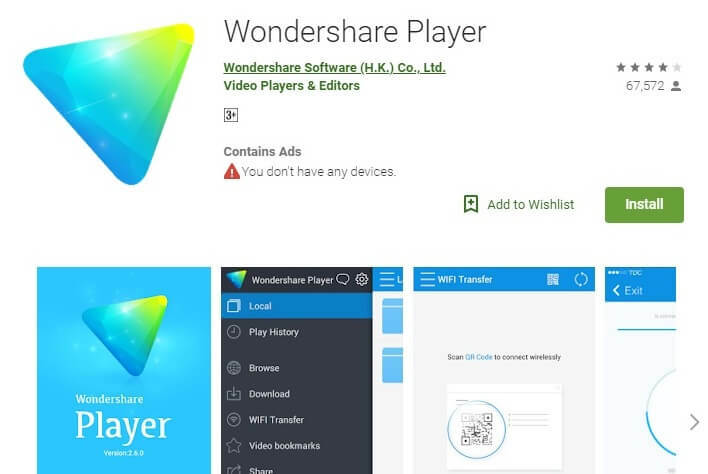 Another great option for Android users is Wondershare player. This powerful Android video player offers a great way to transfer all your video files from your desktop PC or laptop to your smartphone using the local WiFi network. Apart from playing video files with multi-codec support, it also features a video discovery tool that will show you the latest trending videos from popular websites. It also allows you to play videos from Youtube, Hulu, ESPN and a few other sites directly on the app. Mobo Player has been in the market for a long time and has its own share of loyal users. This is courtesy of a simple and easy to use interface and some features like subtitles, continuous playback support, and playlists. It also allows you to stream videos from HTTP and RTSP protocol websites directly through the app. The app also offers plugins that can be installed to increase the functionalities of the app and provide a more enriching experience to the users. 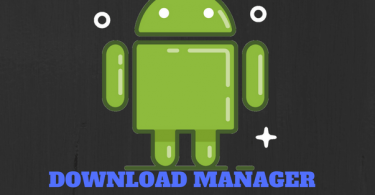 This app is free to download although there is also a paid version with more features. While we have mentioned some of the best video players for Android, it should be noted that this list has not been arranged in any order of preference. Each app is unique in its own way so it is up to you to make your choice. Should you have any suggestions, you may use the comment section below. You may also check out some of the other sections of our website. 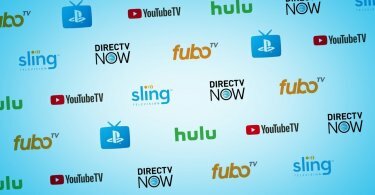 Cutting the Cord: Which TV Streaming Service Is Best?